After the holidays, I was really looking forward to getting back on track and eating healthy! I definitely overindulged this season. Last year, for my wedding shower, a friend gave me a cookbook that I just love. It is called Joyous Health: Eat & Live Well without Dieting and is written by a Toronto based Holistic Nutritionist, Joy McCarthy. I have made several of her recipes and I always return to this book for new ideas! 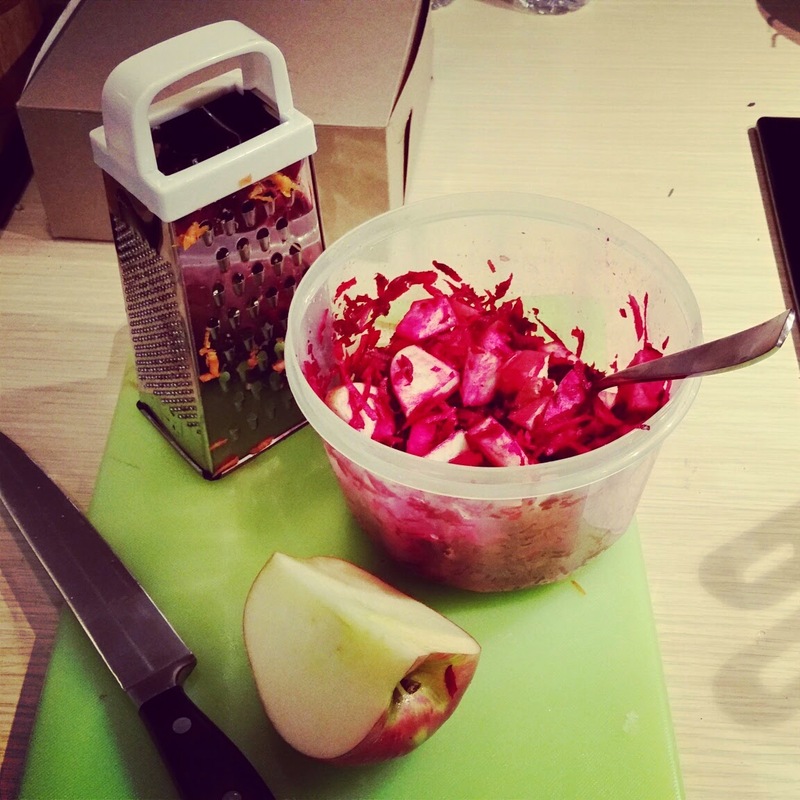 One of my favorite recipes in her book is the Apple Beet Carrot Slaw with Honey Dressing. I'm a HUGE fan of beets and probably eat them every single day. I'm also in love with apples and never go a day without one of those either. So when I see a recipe that blends two of my favorite foods, I knew I had to try it. This recipe is very easy to make and is so full of flavor! The best part about this recipe is that it is so healthy so you can enjoy as many bowls of it as you want and you won't feel guilty. Don't forget that it's vegetarian, dairy-free and gluten-free! 1. 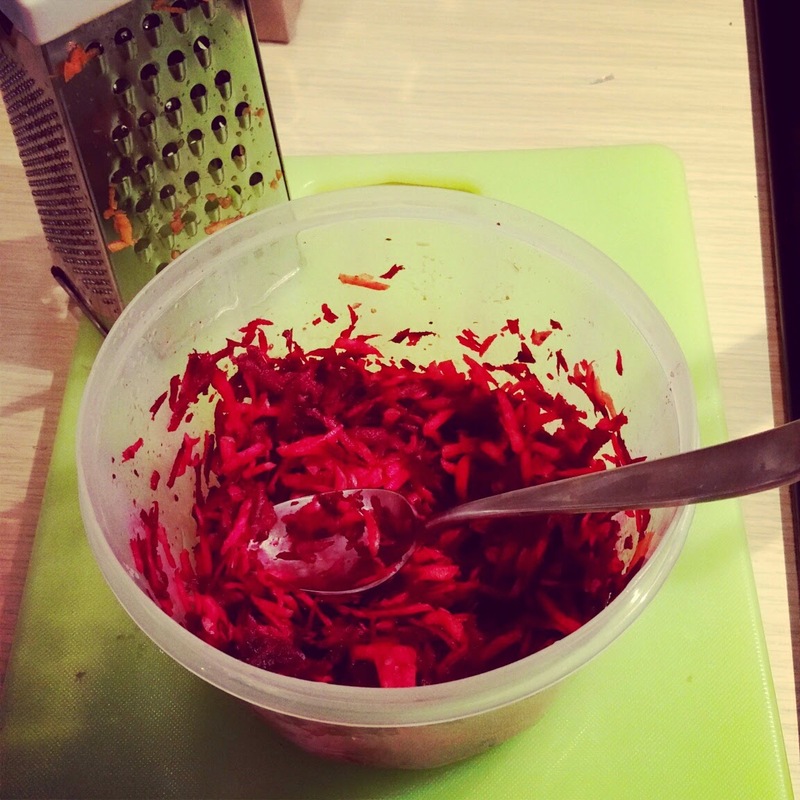 I started by grating my carrots and beets into a bowl. Tip: I like to use the honeycrisp apples. I find they go best with this recipe. Just sweet enough for not too bitter. Tip: I used organic maple syrup instead of honey. I honestly just didn't have any honey in the house and actually prefer the taste of real maple syrup. 3. I then cut up my apples and added them in to the mixture. I stirred it up and it was ready to go! Tip: If you were serving this for a party or event and didn't want your apples to turn purple from the beets, simply add them just before serving. That's about it! This recipe is so easy to make! I love taking it for my lunch at work. It's sweet but tarte and is full of healthy ingredients that help to get me through my day. I think the next time I make it, I might add some candied pecans just as an added treat!